Just recently we finished a couple of new demonstration videos of FA to share with you. The purpose for these videos is to introduce and instruct in using different features and functionalities of FA. You can access the videos with a personal password – please use the contact form below to get your password. Corporate actions can be complicated especially when managing a large number of portfolios. 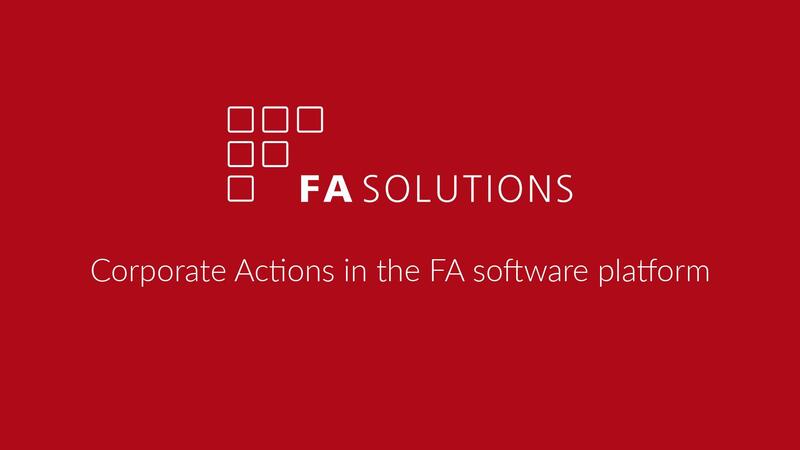 FA’s Corporate Actions overcomes this by providing you with the tools to automate the otherwise time-consuming, cumbersome aspects of corporate action management. FA’s Corporate Actions allows you to control which portfolios to use, which transactions to create, which taxes to apply, and when to exercise the corporate action. In this video we will show you how easy it is to create corporate actions, define the corporate action information, and run or schedule corporate actions to create transactions in your portfolios in FA. Fee Calculation in FA simplifies your portfolio-level fee calculation routines. It allows you to automatically and accurately perform calculations from simple asset management fees to complicated performance fees with High-Water Mark. To save you time, you can simultaneously mass-produce fees for multiple portfolios and efficiently run them for different time intervals. In this video we will demonstrate you how to easily set up your fee calculation models, calculate asset management fees, and create fee transactions immediately or to be automatically calculated on a future date.